The replacement seat covers offered on this page are only for the Ford Mustang models with low-back bucket seats for the 1964 thru 1965 model years. They are manufactured by TMI Products, and are made with Standard Upholstery (Sierra Grain Vinyl). TMI Products include a limited lifetime warranty; cloth products include a 1-year warranty. These replacement standard low-back bucket seat covers are for the 1964-1965 Ford Mustang and Shelby Convertible, Coupe and Fastback models. Manufactured to factory specifications and workmanship. 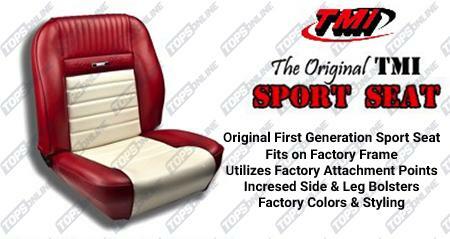 TMI Products set standards above OEM, so you will get the highest quality seats, made with cloth, vinyl, or leather. 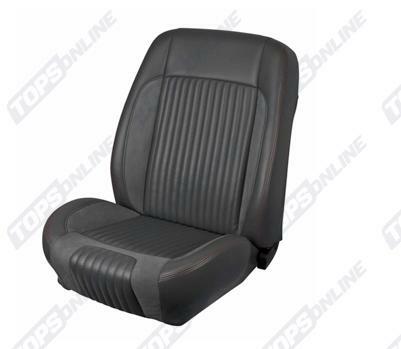 These Factory Style replacement seat covers are for 1964-1965 Ford Mustangs with low-back bucket seats, and are available in a Front and Rear Set, or Front Seats Only. This standard upholstery is Sierra Grain Vinyl just like the factory original standard upholstery offered in 1964-1965. Note: Standard Upholstery is Original Sierra Grain Vinyl. Seat back panels supplied with the kit are without pockets. Deluxe center buttons are not included. Front and Rear Sets include a total of 8 pieces: 2 front seat bottoms, 2 front seat backs, 2 front seat back panels without map pockets, and 1 rear seat bottom and 1 rear seat back. Front Only Sets include a total of 6 pieces: 2 front seat bottoms and 2 front seat backs, and 2 front seat back panels without map pockets. 1965 Shelby Mustang seats originally came in black only; other colors are available as displayed, to match your Shelby Mustang interior. Front seats are the same for all models and can be purchased separately below. Important: Please compare your existing seats with the image we provide here. It is common for Mustang seats to be switched out from one year to the next by restorers; by comparing the image with your actual seats, you can be sure you are getting the right seat covers for your car. Don't see an image? Send us a picture of your seats and we'll help you make the right buying decision. Rear Seat Foam Note: Rear Seat Foam is available for some models; because it ships oversize, please inquire so we can get you an exact quote with accurate shipping. 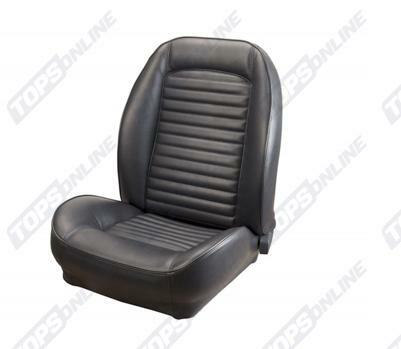 Front Bucket Seat Foam Note: We offer front bucket seat foam with and without listing wires. Listing wire is where the upholstery listing channel attaches. Factory original replacement seat foam did not include listing wires (you had to re-use your existing wires or fabricate new wires), so some restorers may opt to order seat foam without listing wires to stay original. However, we offer seat foam with listing wires molded directly into the foam for ease and convenience. 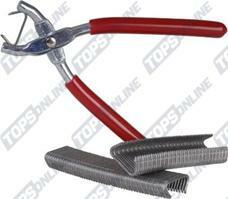 We recommend purchasing the foam WITH listing wires. These Standard Sport Seat replacement low-back bucket seat covers are the Full Set (Front and Rear), or Front Only Set, for 1964-1965 Ford Mustangs (Coupe, Convertible, and 2 + 2 Fastback models). 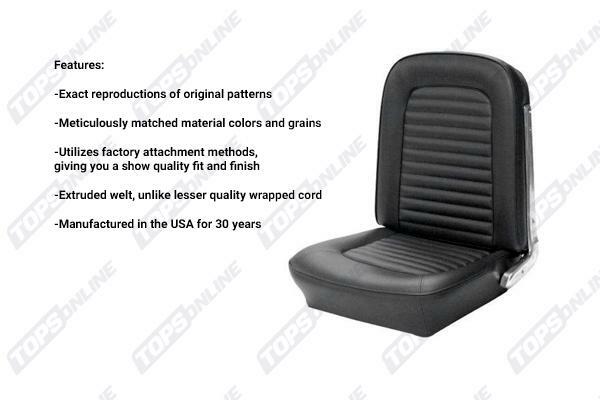 This Standard Sport Seat Upholstery is made with Sierra Grain Vinyl Trim with Sierra Grain Inserts. Although this is an aftermarket upgrade, this upholstery fits on the factory frame and uses the factory attachment points. New Sport Seat foam is required for a proper fit on the front bucket seats and provides increased side and leg bolsters. The Full Set (Front and Rear) includes a total of 8 pieces: 2 front seat bottoms, 2 front seat backs, 2 front seat back panels without map pockets, 1 rear seat bottom and 1 rear seat back. The Front Only set includes a total of 6 pieces: 2 front seat bottoms, 2 front seat backs, and 2 front seat back panels without map pockets. These Standard Sport II Seat replacement low-back bucket seat covers are the Full Set (Front and Rear), or Front Only Set, for 1964-1965 Ford Mustangs (Coupe, Convertible, and 2 + 2 Fastback models). This Standard Sport II Seat Upholstery is made with Sierra Grain Vinyl Trim with Sierra Grain Inserts. Although this is an aftermarket upgrade, this upholstery fits on the factory frame and uses the factory attachment points. New Sport II Seat foam is required for a proper fit on the front bucket seats and provides increased side and leg bolsters. This is the second generation sport seat with a new, more aggressive shape with increased side and leg bolsters. These Standard Sport R Seat replacement low-back bucket seat covers are the Full Set (Front and Rear), or Front Only Set, for 1964-1965 Ford Mustangs (Coupe, Convertible, and 2 + 2 Fastback models). This Standard Sport R Seat Upholstery is made with Premium Black Vinyl Back and Sides with Unisuede Inserts. Although this is an aftermarket upgrade, this upholstery fits on the factory frame and uses the factory attachment points. New Sport R Seat foam is required for a proper fit on the front bucket seats and provides increased side and leg bolsters. The Full Set (Front and Rear) includes a total of 8 pieces: 2 front seat bottoms, 2 front seat backs, 2 front seat back panels without map pockets, 1 rear seat bottom and 1 rear seat back. The Front Only set includes a total of 6 pieces: 2 front seat bottoms, 2 front seat backs and 2 front seat back panels without map pockets. These vinyl upholstery sets have Vinyl Bolsters with Premium Black Vinyl Back and Sides and High-Quality UniSuede Inserts. They also have Contrast Stitching throughout in a variety of colors. This upholstery transforms factory seats into the third generation Sport R, modern and aggressive style seats.